<?xml:namespace prefix = o />A community in Fayette County, <?xml:namespace prefix = st1 />Thurmond, WV, was established in the early 1800’s, and was named for Captain W.D. Thurmond (CSA), who owned the land upon which the town is located. It grew to be an important railroad town, serving as the commercial center of the New River coal industry. With the huge amounts of coal brought in from area mines, it had the largest revenue on the Chesapeake & Ohio Railway (C&O). Having many coal baron among its patrons, Thurmond's banks were the richest in the the state. Across the river was Southside Junction at the confluence of Dunloup Creek and New River. Thurmond was a dry town, while Southside’s character was more wide-open, with saloons and gambling. Thomas McKell developed the area, which included the Dunglen Hotel on the banks of the river. Thurmond is one of the two rail towns located within the New River National Gorge. The other is Quinmont. In 1889, the C&O constructed a 4 track yard, passenger and freight depot, a turntable, water towers, and an engine house at Thurmond. The town was incorporated in 1903, and remains so today. By the early 1900s, hundreds of railroad cars of smokeless coal were being shipped through the town daily from several nearby branch lines. Thurmond produced more freight revenue than did the much-larger cities in the East and Mid-West. The years 1910 to 1930 witnessed the greatest growth at Thurmond and by 1930 it had a population of 450. The Dunglen Hotel burned in 1930, and business in Thurmond declined somewhat during the depression as banks and other commercial enterprises relocated to Oak Hill and Beckley. The war years provided renewed vigor to the C&O, but by the 1950’s Thurmond began to subside once again. The coalfield had begun to play out, and the switch from coal to diesel fuel reduced railroad employment in the town significantly. 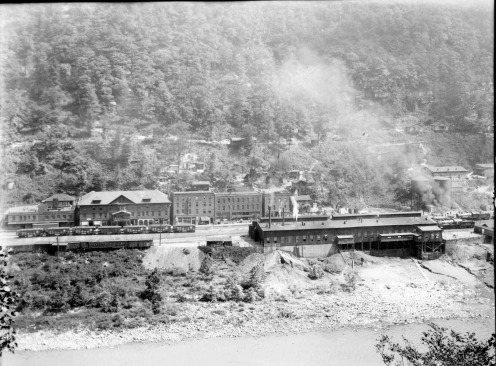 The establishment of the New River Gorge National River in 1978, and opening of the Thurmond Depot as a seasonal visitor center in 1995, kept the heart of the New River Gorge on the map. Thurmond Depot's seasonal hours are 10:00 AM to 5:00 PM. Amtrak’s Cardinal continues to serve the town as a flag stop three days a week, as it runs between New York and Chicago. The restored depot is open daily during the summer and houses exhibits that interpret the town and railroad operations. A short walk downtown offers a look of the once thriving town. A walking brochure is available. Caution should be used around the railroad tracks as it is still active. The train depot is on of the National Coal Heritage Area Passport Stamp locations. The National Park Service offers a brochure that is very helpful when planning a tour of Thurmond and other coal heritage sites in the park. Descriptions of attractions include driving directions and an excellent map. Wayside exhibits bring the nature and history of the gorge to life along the way; waysides are in place at Kaymoor mine, Canyon Rim Visitor Center, Grandview National Park, Sandstone Falls Visitor Center, Fayette Station Road, and in Glen Jean. For more information or a brochure contact the NPS at www.nps.gov. or visit Canyon Rim Visitor Center off Route 19 just north of the New River Gorge Bridge. You may also download the brochure by clicking here. A Historic lesson based on the railroading days of Thurmond can be found here.